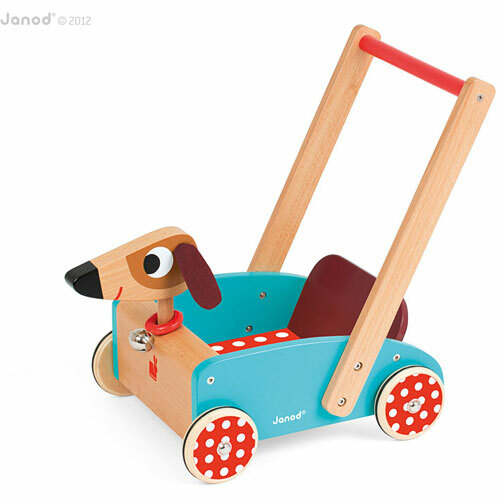 Take your toys and stuffed animals out for a stroll in the Crazy Cart! Push the cart to make the bell ring. The very practical rubber rings do not leave any marks on the floor. Solid wood cart with metal wheel axles and lightweight felt ears. Wheels, bottom and back piece of the cart in plywood, sides in MDF, head, handle and front piece of the cart in beechwood. Closed colour box. Measures approximately: 19.29 x 12.20 x 17.91 inches..